While most Oregon fan have all but forgotten Bryan Bennett after he lost his job to Marcus Mariota, I have been following him at Southeastern Louisiana University (SELU). SELU, being the college I will attend in the near future, made it particularly interesting to me when Oregon’s QB transferred there. Ironically, while everyone is jumping on the “Mariota’s overrated” bandwagon, Bennett’s stock is on the rise, and he is being seen as a potential mid-round NFL draft pick. Bennett toting the rock for Oregon. Since being at SELU, Bennett has played well and routinely showed off the ability that got him to Oregon in the first place. In his first year of “exile” in Hammond, Louisiana, Bennett threw for more than 3,000 yards with a 60% completion rate and ran for 1,000, scoring 37 total TDs. This would make him the team leader in both categories. On the negative side, Bennett also had 11 INTs; despite this he led SELU to the FCS playoffs, and had a solid year overall. In his second year at SELU, Bennett came out of the gates with one of his better games in his career, throwing for 2 TDs and 1 INT with 311 yards passing, adding another 97 yards and a TD on the ground. In this game against Jacksonville State, Bennett had career long TD passes and rushes of 89 and 83 yards respectively, as well as a season-best 68% completions. He then led his team in rushing yards for the second straight week against Utah State, scoring 3 more TDs with one INT in the victory. Bennett will be a dark horse QB candidate in the upcoming NFL draft. Game 3 was the one everyone had circled on their calendars as Bennett played his only FBS opponent of the year in Tulane. Unfortunately, Bennet did not play well against the Green Wave, going into the half down 28-3. In the second half Bennett began to rally his team, cutting the lead to 13 before throwing a late pick that allowed Tulane to seal the 35-20 victory. 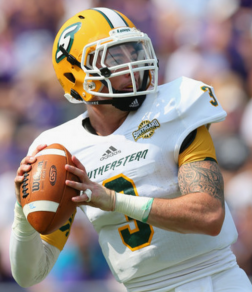 After this game Bennett went on to have a solid season, being a Walter Payton Award candidate for the second straight year and leading SELU to their second FCS playoff in as many years. In a playoff game against Sam Houston State, Bennett played on an injured foot. He set the school record for career TDs with 69, running for two and throwing another in this game. Despite this, Bennet clearly struggled to throw accurately and completed only 17-of-48 passes in the 21-17 loss. These two former teammates’ stories may yet be intertwined. Going into the 2015 NFL Draft, Mel Kiper, Jr. of ESPN has Bennett ranked as a mid-round pick and as the No. 6 QB overall. Interestingly one can draw parallels between Bennett and Mariota. They have very similar skill sets, sizes and builds. Both have had similar success at their levels of play since being teammates in 2012. Both of them had great debut seasons, being candidates for their respective player of the year awards before having somewhat lackluster second years. The biggest difference in playing style is that Bennett is much more a gambler and a gunslinger, as reflected by the number of INTs he throws. While both QBs are clearly talented, Bennett is the much rawer of the two and will need to develop behind a veteran to make it in the league, while Mariota could start immediately. 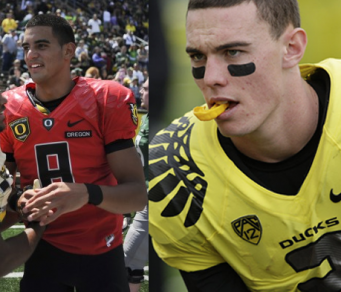 Nonetheless these two QBs futures could very well be intertwined, with many Oregon fans likely to compare their careers at the pro level.